The HCG (Human Chorionic Gonadotropin) diet is an effective weight loss program. It works by limiting the calorie intake per day to around 500. Calories are units used to measure the energy contents of food and drinks. HCG is a protein-based hormone that is produced in large amounts during the first three months of pregnancy. When a non-pregnant person takes HCG, the HCG kick-starts weight loss without the normal side effect of a low-calorie diet, such as weakness, hunger, headache, and irritability. HCG is available in injections, sprays, pellets, oral drops, and pills. It is also consumed with low-calorie foods. This combination is called the HCG diet. • Be under medical supervision and seek medical advice every time. • Only consume low-calorie foods such as one portion of lean protein, bread, vegetable, and fruits. 2. At the second stage, you continue taking HCG, but you eat only 500 calories per day for 5 weeks. 3. At the third stage, stop taking HCG and increase your food (without sugar and starch) intake for 4 weeks. There have been a lot of debates about the benefits and risks of HCG; some people are of the opinion that there are better and less risky ways to lose weight, whereas other people think there is no other way to lose weight that is better than HCG diet. However, if you are considering the HCG diet, it is important that you know the pros and cons of HCG before you start taking it. You can do this by asking a health specialist questions about HCG diet or by seeking information from someone who lost weight by taking HCG diet. 1. HCG is extracted from humans; therefore, it is natural and totally safe for human consumption. In other words, unlike other weight loss supplements, HCG does not have the capacity to trigger harmful implications after consumption. 2. It is a very fast way to lose weight. 3. Most people who are overweight have the problem of controlling their appetite. This makes it hard for them to lose weight through exercise or by staying off their favorite foods. This problem can be solved by taking the HCG diet. HCG helps in reducing appetite and this helps you achieve a remarkable weight loss. 5. HCG stops the formation of fat in your body by hindering the enzymes that catalyze the formation of fat. 1. HCG causes allergic reactions. If after taking HCG you notice swelling in any part of your body or difficulty in breathing, see your doctor. 2. HCG promotes the development of ovarian hyperstimulation syndrome. 3. HCG diet does not guarantee weight loss in the long run. 6. When you are taking HCG you need to visit your doctor frequently. 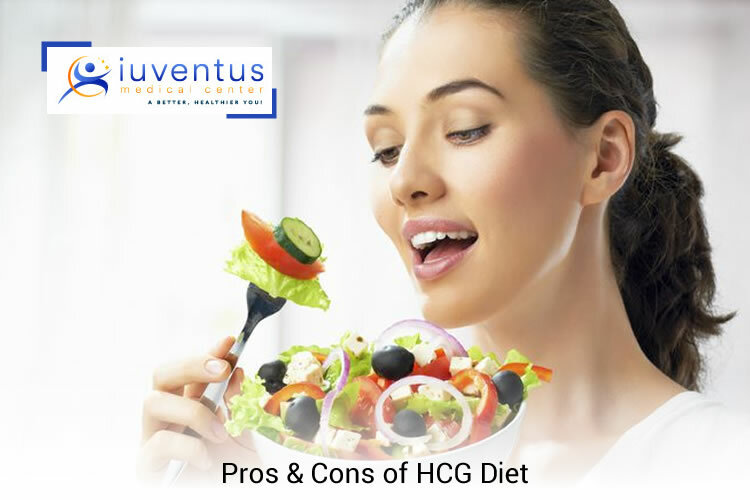 Detailed above are the Pro’s and Con’s of HCG diet; which will help you to understand its importance and adopting the same to your lifestyle.